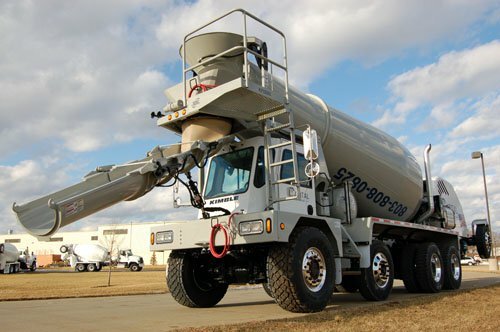 Glider-kitted front-discharge concrete mixer trucks might be left alone in the Phase 2 Fuel Economy and Greenhouse Gas emissions proposals, now inching toward finalizing by the U.S. Environmental Protection Agency. The official was Matthew Spears, executive director of EPA’s Heavy Duty Diesel Program in Ann Arbor, Mich. He was among panelists discussing the Phase 2 proposals during the Technology & Maintenance Council fall meeting earlier this week near Orlando. Proposed rules on glider kits would require volume builders to use current engines instead of old ones. This would delete most of the dollar savings that glider kits offer. Spears said EPA is aware of that, but it wants to stop the emissions emitted by volume-producers of gliders, which the agency pegs at 300 or more per year. A low-volume, under-300 exemption could be granted to Phoenix and Advance, he said. However, Advance is owned by Terex Roadbuilding, a large company under EPA’s definitions, which might cause Advance to be caught by the volume provision. Officials of Advance have sent comments to EPA noting that its operation in Fort Wayne is a small one and should be considered separate from Terex. “We’re in discussion with them,” Spears said of Advance. “That kind of truck accumulates very few miles and hours in a season, and trucks wear out well before the engine’s useful economic life, which we put at 435,000 miles. An engine might go through three trucks in that period, and it makes sense to reuse it each time a truck wears out. Spears’ opinion might or might not be shared by top officials in EPA, who’ll make the final decisions. EPA and the National Highway Traffic Safety Administration are taking comments on their joint proposals that were issued in late June. They require lower emissions of greenhouse gases, especially carbon dioxide, and greater fuel economy. They will go into effect for model-year 2018 trucks and engines, and run through MY 2027. Phase 1 rules went into effect last year and are reducing emissions and saving fuel, Spears said. Comments on the proposals can be sent by all interested parties until October 1, when the comment period closes. Spears said the agencies will then finalize the Phase 2 rules by next year’s second quarter.